Upon arriving in Quanzhou, I was struck by how much the city has progressed since I last visited. The development the city has undergone during the past couple of years during China’s economic boom has been staggering. Modern infrastructure exists together with old buildings preserved since the Tang Dynasty, resulting in a juxtaposition between old and new. Quanzhou may not be a famous tourist destination, but it holds a major significance in China’s history. A coastal city on the south eastern Fujian province, this city was one of the busiest ports in the world during the Song Dynasty; Quanzhou used to be an avenue for trade with Arabs and Tamil merchants among others. It is also an epicenter for emigration since many residents left the city and moved to the neighbouring Southeast Asian countries, accounting for the majority of the Chinese communities throughout the region. The city’s history of emigration plays a role in one of the distinctive architectural details in Quanzhou’s old buildings. The buildings along the Licheng District have curving ends on their roofs comparable to the tails of swallows. 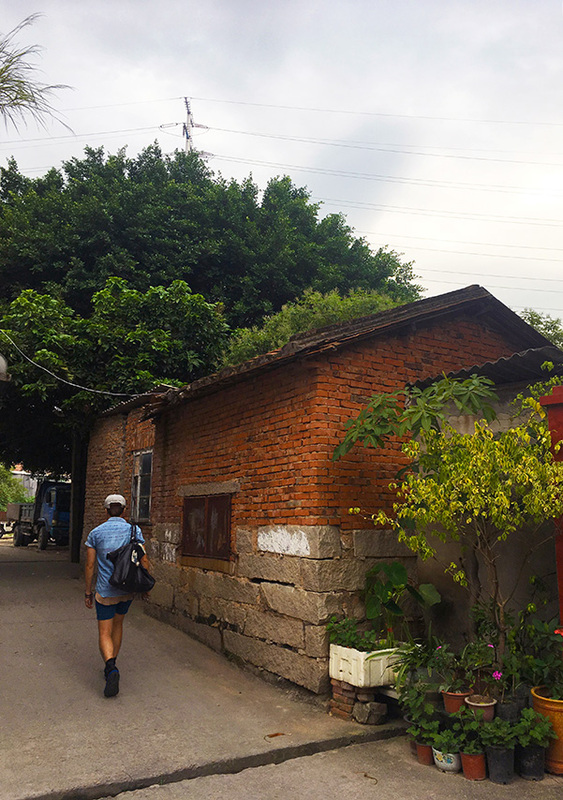 The tour guide explained that like the swallows, many of Quanzhou’s immigrants return to their hometown with their families, settling there again after being away for so long. I also visited another historic district in the city where lower class communities still reside. The buildings were not restored and were quite dilapidated, but since they were made of bricks, stone, and tiles, their structures still remained intact. 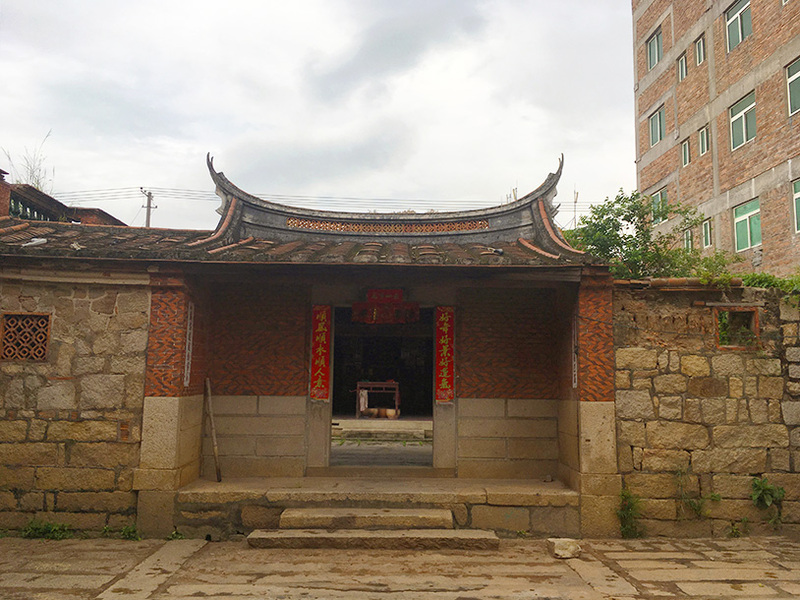 Despite the few remaining residents in the neighborhood, some buildings are now deserted and are used as shrines for the ancestors of various clans. 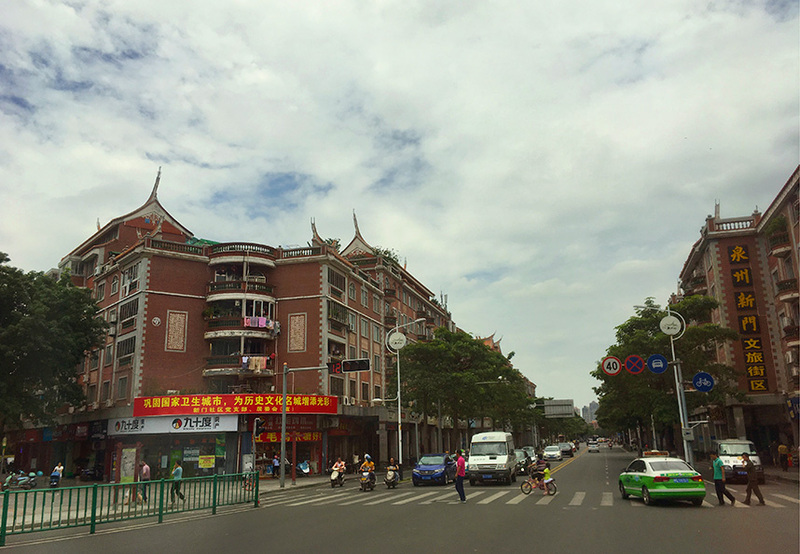 The deteriorating buildings around the neighborhood were a stark contrast to the new high-rise apartments around the vicinity for the growing middle class population of China. 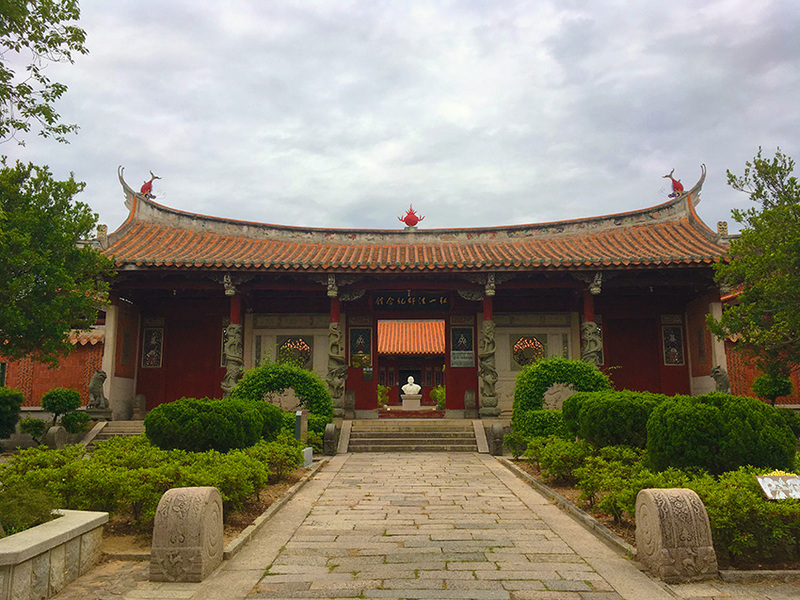 Various cultural influences are also noticeable in Quanzhou’s architecture. Because of its history as a port city, many immigrants also settled there and brought their cultures and religions. 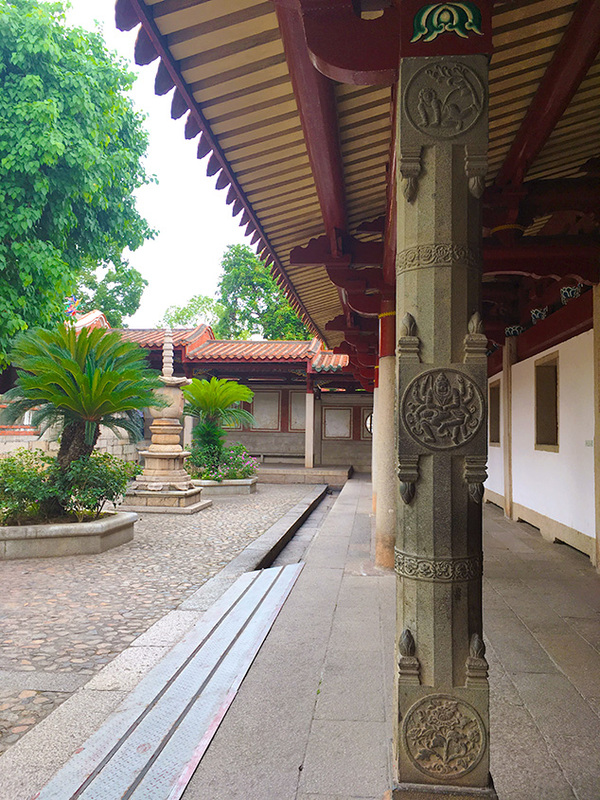 The Buddhist Kaiyuan Temple has Hindu-Tamil influences that is evident in the stone engravings of Vishnu and his avatars throughout the temple complex. 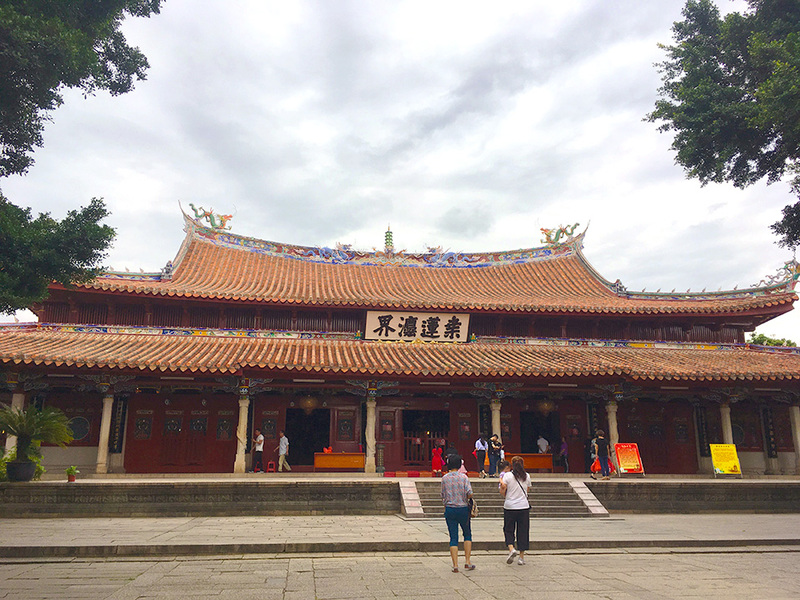 Built in 685 during the Tang Dynasty, the temple was initially a Hindu temple dedicated to Shiva but was then converted to a Buddhist temple in 692. The twin pagodas were added in 916, first with wood, then with brick and stone after the original pagodas burned down. A few kilometers away from the temple is a lingam erected in the Bamboo Stone Park (however most passers-by simply see it as a cylindrical stone). 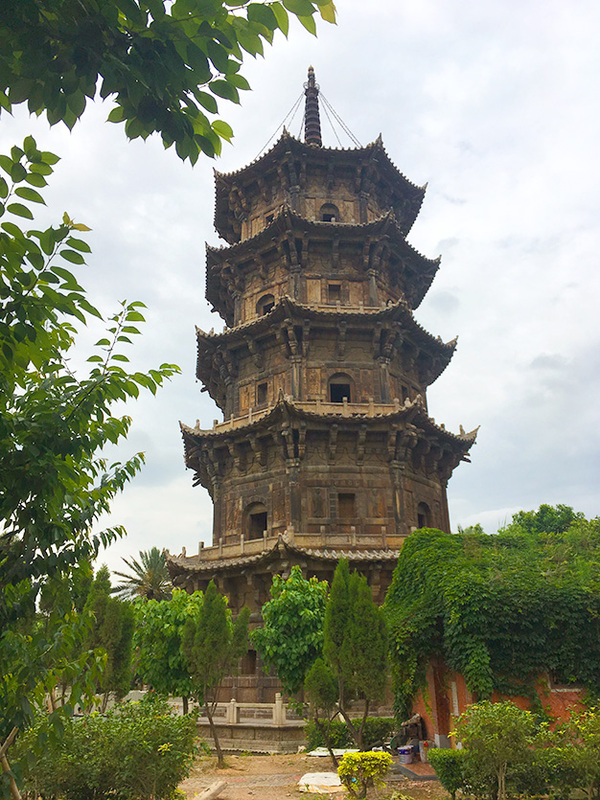 The Qingjing Mosque is also located in the city and is the oldest in China, constructed in 1009 by Arab immigrants. Unfortunately I did not get to see the mosque due to lack of time. Once a humble coastal town, Quanzhou has now transformed into a big city complete with large buildings, a mall, asphalt roads, and clean sidewalks. I stayed in Wanda Vista hotel, one of the newer ones in the city, connected to the Wanda Mall with a shopping street and a boardwalk along the riverside. Looking at the view of the city from my room, I could see the city’s skyline occupied by clusters of high-rise buildings. There isn’t any modern architectural highlight of the city, but I believe that Quanzhou’s rapid development is already an amazing feat in itself. It’s not surprising for major cities like Beijing and Shanghai to be developed and modern, but for a provincial city like Quanzhou to be as urban as a capital city like Manila is incredible.